I love to eat, but the things I like to eat venture on the more “tame” side. I’ve been challenging my tastebuds and my comfort zone a lot this year. There was partridge pate in Spain, smoked reindeer in Finland, and even sheep head here in Morocco. All of which I liked. I’m big on having my kids try at least one bite of new foods so with that in mind I have to set a good example and practice what I preach. 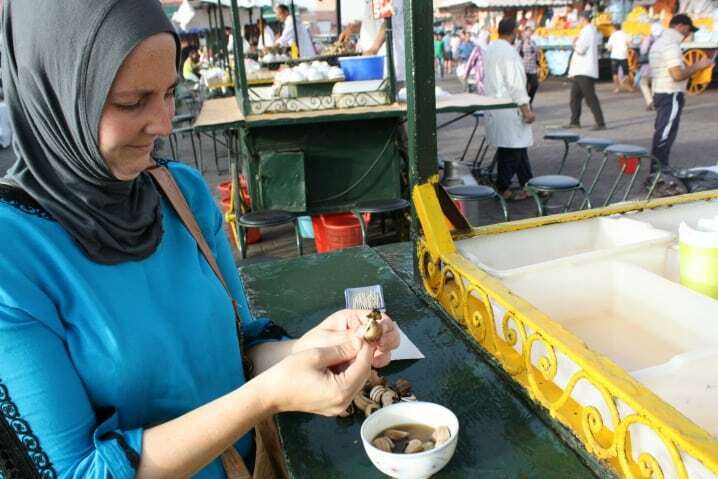 MarocBaba and I were out researching some new locations for our “freaky food tour” of Marrakech and the need arose to evaluate snail selling stands. He likes snails, so he was going to be the final judge. I was along to photograph and keep notes. But then he talked me into trying them. I said no but gave in, because why not? It went like this. There’s two sizes of bowls offered, we had the large one (though small would have sufficed). Toothpicks are the extraction tool of choice. They pull out pretty easy but are springy. I knew texture was going to be an issue. This one is a little better, you can see how it comes out of the shell. The good news was the vendor told me how they’re cleaned. Each one individually and they’re all cooked while still alive. Freshness is a big factor when it comes to street food. As a rule I always talk to the vendor before eating to get the story behind the food, where it comes from and how it’s prepared. The broth is highly sought after as it’s believed to have curative properties. There’s a special “snail” blend that can be purchased from spice vendors. There was a time I would have really contemplated putting it in my mouth but I’d already committed. It doesn’t smell bad, so I took a big breath and popped it in my mouth…..
Two bites was all I could take before I spit it out. Not a snail fan. It’s really the texture that’s just way too chewy for me. There was another couple across from us and the husband was not having any of the snail-ness either. I think it’s one of those love it, or hate it things. Been there, done that, not again! What’s the strangest food you’ve eaten and what did you think? 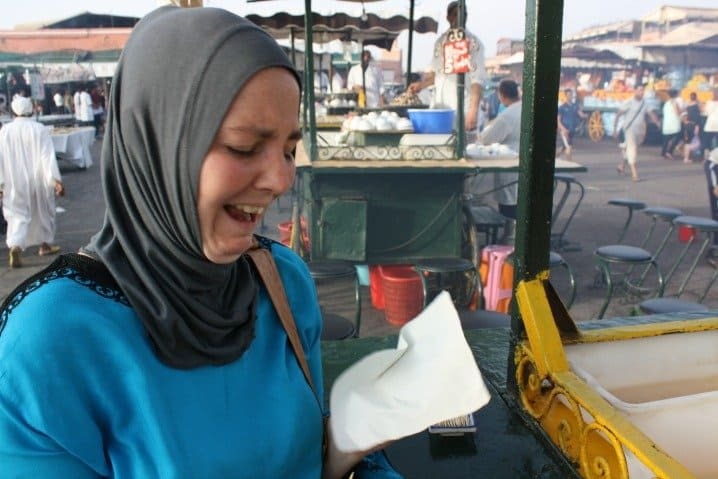 Want to try some other freaky (or not so freaky) food in Marrakech? 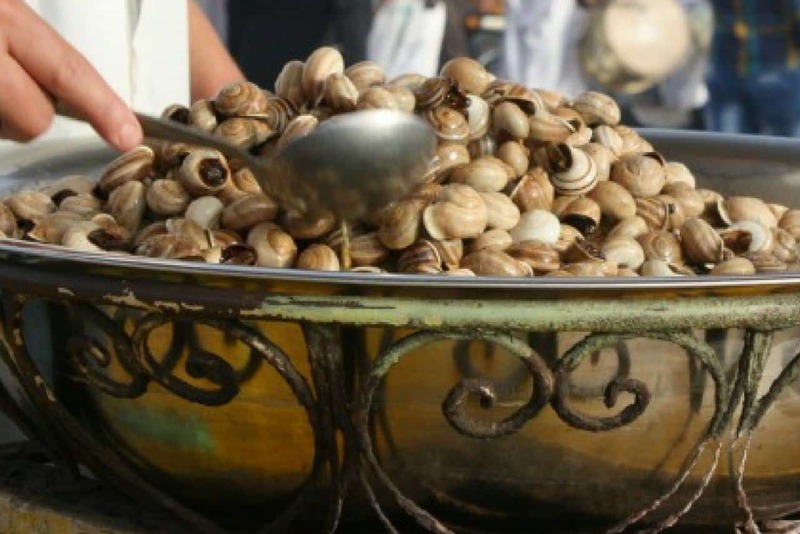 Sign up for our Marrakech Food Tour when you’re in town! I ate tripe once in France, that was horrible! Last year i tried the snail too for the first time. I’m coming in Morocco for 12 years now but never tried it before. I did drink the broth before, wich tastes very good actually. Back to the snail, my husband had to bite of the two feelers on the head of the snail, first. Because i had the feeling the snail was staring at me. But finally, with his feelers chopped of, i ate it. And it tasted like a piece of tough meat. So, i tried it, but i didn’t particulary liked it. I thank you for trying that one snail, Amanda, because now I don’t have to! Just consider that you have taken one for the team! The look on your face is priceless. I can imagine how MarocBaba must have laughed, and probably the vendor too! I like snails! Done the French way usually, bigger snails too. I’ve never tried the Moroccan ones but I really think I should, will you take me to the best stall? I ate them again in Portugal that was closer to the French way and they were much better but still one was enough. 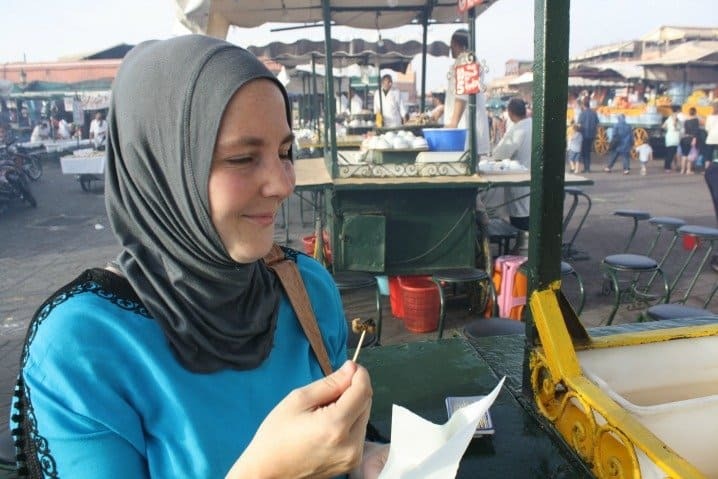 Of course I’d take you to the best snails in Marrakech! 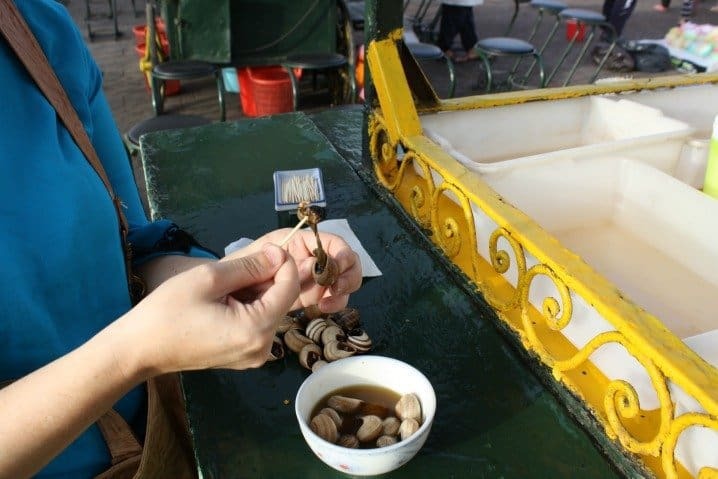 We also tried snails in Marrakech. Let me rephrase that, as I did not. My son did. 😉 Not sure he wants any more. We were just in Marrakesh and the kids loved checking out the street food. Their biggest find was the cooked whole lamb heads. They wouldn’t eat them though. That’s great! 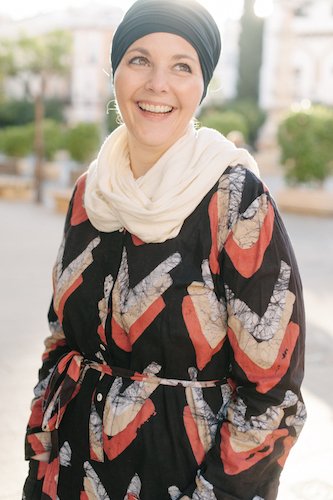 We’re working on a kids street food tour to add to our Marrakech Food Tours — so much fun! Snails, you either love them or hate them. Horse sashimi. Once you get over the fact you’re eating horse it wasn’t that bad. I agree about these snails! My husband, however, has managed to convince me of the healing properties of the broth so I have been know to drink (be force fed?) the brothe when I have had a winter cold. Still, it’s all gross. Frog is nice! Like the tenderest chicken you’ve ever eaten. I grew up eating periwinkles, so I’m fine with snails. I prefer the snails to the broth, though. LOL….I got some good pictures of those snails trying to crawl out of the baskets…Your face is hilarious, I won’t try them…Thanks!! !